Sergio Marchionne told Ranieri he should be fired and that his actions were "utterly stupid and unconscionable." Editor's note: Story contains strong language. Fiat Chrysler Automobiles CEO Sergio Marchionne berated a top company spokesman in 2015 for saying the company didn’t rig its vehicles with illegal software to pass emissions tests, according to documents filed in a related lawsuit. 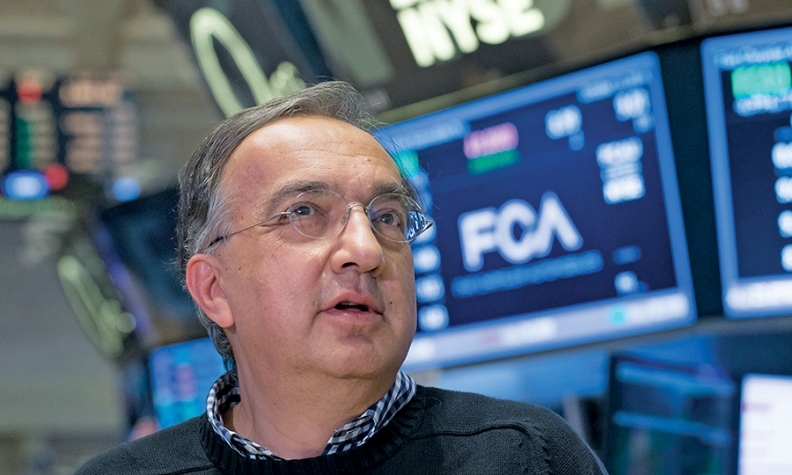 An excerpt of the 2015 email from CEO Sergio Marchionne to Fiat Chrysler’s then-head of U.S. communications, Gualberto Ranieri, was revealed in federal court in Manhattan on Monday. The spokesman had issued a statement days after Volkswagen AG admitted to cheating on emissions tests that Fiat Chrysler did not use so-called defeat devices. The communication was produced by Fiat Chrysler in a lawsuit brought by shareholders in 2015 claiming the company misled investors about vehicle safety problems. The lawsuit, filed in federal court in Manhattan as a class action, claims that Fiat Chrysler failed to comply with U.S. vehicle safety laws, failed to submit required early warning information to U.S. regulators, delayed recalls, downplayed U.S. investigations and under-reported recall costs. The court has rejected attempts by Fiat Chrysler to dismiss the case. Fiat Chrysler has denied intentional cheating on its diesel emissions. Ranieri went back to Italy in 2016 and continued to work for the company until earlier this year. Marchionne and Scott Kunselman, former head of Chrysler’s vehicle safety and regulator compliance, are named defendants in the suit. Separately, the U.S. Justice Department sued FCA in May 2017 alleging the company used illegal emissions software on diesel-powered pickups and SUVs to circumvent U.S. emissions tests. The government alleged Fiat Chrysler sold nearly 104,000 Ram 1500 pickup and Jeep Grand Cherokee SUVs with 3.0-liter diesel engines that contained defeat devices. A defeat device allows a vehicle to pass government emissions testing while exceeding pollution standards under actual driving conditions. Marchionne has denied that the company intentionally tried to cheat on emissions standards, which Volkswagen admitted to doing in 2015. FCA said in its statement Monday that while it’s in settlement talks with the government and private parties, it will “vigorously” defend itself against any claim that it intentionally cheated on emissions tests. Emissions-cheating allegations were added to the original safety-focused investor suit in 2016. The initial complaint contended FCA stock slid nearly 5 percent in July 2015, when the company entered into a consent order with the National Highway Traffic Safety Administration admitting safety act violations and agreeing to pay a $105 million fine. Chrysler agreed to a second $70 million fine in December 2015, setting off another drop, according to the lawsuit. The amended complaint tied additional share price drops to news alleging FCA used VW-like devices to make vehicles act differently while being tested for environmental law compliance than when in normal operation. The lawsuit claims FCA hid this from investors as well as regulators. Citing internal FCA communications, the unsealed document names several employees and executives at the company who were involved in diesel vehicles and company communications with regulators regarding emissions compliance issues. An October 2014 email showed multiple executives, including Kunselman, were aware that California regulators had identified defeat devices in Chrysler vehicles, for example. The unsealed document also alleges that several employees knew the company’s diesel vehicles contained defeat devices before regulators made their concerns public. In one example, the document alleges a Chrysler employee claimed to have alerted upper management that diesel engines contained such devices and indicated that a description of an emissions control strategy the company provided to regulators was inaccurate in internal messaging communications in 2014. In a statement, Fiat Chrysler said the emails cited in the document have already been provided to regulators and that the company continues to cooperate with the ongoing probes into its diesels. “It is inappropriate to draw conclusions from isolated communications and internal deliberations, without the more detailed context that is part of the reviews FCA is conducting as part of the investigation process,” the company said. The case is entitled Koopman v. Fiat Chrysler Automobiles N.V., 15-cv-07199, U.S. District Court, Southern District of New York (Manhattan).